Fiction: Two Twin Beds and a Coffee Pot by Cheryll Snow | LADY. Sarah waited until she heard her husband’s deep snoring beside her. She carefully pulled back the covers and placed her bare feet on the floor. The bedframe groaned with the sudden shift in weight. Sarah froze in place. She looked over at Jeff’s prone silhouette in the darkened room. He hadn’t moved. She breathed a sigh of relief. He wasn’t going to wake up anytime soon. Not with that much alcohol sloshing around in his bloodstream. The longer he stayed passed out the better. She had things to do. As she padded down the short hallway to check on her kids, she felt a sharp pain in her left foot. She hobbled to the bathroom and shut the door behind her before flipping on the switch. Bracing her foot against her knee, she discovered the reason for her pain. Glass. A healthy shard of it, too. Undoubtedly from the vase Jeff threw in her direction earlier. She bit down on her bottom lip as she pulled it out. She tossed the piece of glass into the sink with a clatter and looked at the damage to her face in the mirror. The harsh fluorescent lighting wasn’t kind. But even if the illumination in the room was softer, she still couldn’t dismiss the battered image looking back at her. Quick tears filled her eyes, but she willed herself not to cry. Things hadn’t always been this way. There was a time when the two of them were happy. Young and naïve and without a dime to their name, they had tried to make a go of it. For the baby’s sake. And she loved Jeff. Or at least she had back then. Combing back her dirty blonde hair with her fingers, she tried to look past the bruises and see the woman she once was. She couldn’t find her. She would turn twenty-five next month. She felt much older. Disheartened by the stranger looking back at her, she opened the medicine cabinet to look for some Tylenol and a Band-Aid. She thought about the chain of events that led up to their latest fight. She brought him the bottle and he poured ketchup over his meatloaf, mashed potatoes, and green beans. He wolfed down his dinner, then lay on the couch in front of the TV and flipped through the channels with the remote. Long accustomed to his volatile mood swings when he drank, Sarah steered herself and the kids away from him. After washing the dishes, she read a story to their three year-old, Michael, and tucked him into bed. Then she gave Matthew his bedtime bottle and laid him in his crib. She kissed his downy forehead. “Sweet dreams, baby boy,” she said softly and turned out his nightlight. When she came back into the living room, she was surprised to find Jeff still awake. She hoped he would pass out on the couch and leave her in peace. Her nerves were frayed from walking on eggshells around him. “Nothing good on tonight,” he muttered. Tossing the remote onto the floor, he got up from the couch and made his way on unsteady feet to the kitchen. Moments later, his booming voice resounded throughout the bungalow. Jeff’s large frame filled the space in front of the open refrigerator door. Sarah didn’t know what to say. He slammed the door shut. He started to reply, but his attention was drawn to the leaky faucet at the kitchen sink. In the heavy silence, the steady dripping seemed overly loud. Sarah could hear Michael stirring in his bed in the next room. “Jeff, you’re going to wake up the babies,” she said. He ignored her. “But—I did!” she stammered. Her stomach and mouth felt sour. She sensed the situation was about to spiral out of control. “The plumber came this morning. I found one who would do a free estimate, just like you said, and he took a look at it.” She stopped. “So why didn’t he fix it?” he demanded, as he took a step toward her. Sarah backed away. Sarah knew it was a loaded question. She swallowed hard. He let out a string of expletives as he quickly walked toward her. Sarah pressed her back against the wall. A surge of adrenaline coursed through her as he closed the distance between them. But then he brushed past her through the doorway and into the living room. “I get no respect from you,” he said. His tirade continued as he scattered the evening newspaper across the floor and lifted up the sofa cushions in search of the remote control. Sarah pressed her lips together as a bubble of anger simmered inside her. She knew he was grasping at anything to bait her with. Their tiny, two-bedroom bungalow was spotless. As well as her kids. Jeff began his protests anew as he settled onto the couch to watch a football game, but Sarah tuned him out. She leaned against the doorway and stared out at the night through the living room window. It was frigid cold outside. The bare branches of an ancient oak tree in the side yard scratched its fingers against the windowpane. A sliver of moon was captured in the upper left corner of the window, stark white against a starless sky. The forecast called for snow tomorrow. Maybe she would bundle the kids up and build a snowman. Matthew had never seen snow before. The scenario made her smile. Her thought processes were interrupted by the sound of the baby’s muffled crying. She turned on her heel and started toward their bedroom. A sudden explosion went off next to her face. At first she thought a gun had been fired. But then a shower of broken glass rained down on her, and she instinctively ducked her head and covered her ears. She whirled around to find Jeff glaring at her from across the room, his lips drawn back in an angry snarl. “Don’t you walk away from me when I’m talking to you!” he bellowed. She looked down to find the remaining pieces of the glass vase scattered across the carpet at her feet. Behind her on the wall, the thin plaster was caved in where the object had struck. Jeff’s hands balled into fists at his sides. Without thinking, she picked up the jagged bottom of the vase and hurled it back at him. It bounced off his meaty shoulder and landed on the floor. Sarah turned and ran for the bedroom. Sometime later, Jeff stumbled out the front door and climbed into his truck, leaving Sarah in a crumpled heap next to their bed. She could hear Matthew wailing in his crib. She knew Michael had to be awake as well. She listened as Jeff revved the engine and drove away. Tears dripped off her chin as she uttered every foul name and word she could think of. She slowly got to her feet. On her bureau, a glass paperweight in the shape of a bird caught her eye. Jeff had given her the trinket a long time ago, when his words and hands were soft and never hurled at her in anger. She picked it up and felt the heaviness of it in her palm. Before she knew what she was doing, she threw it across the room and shattered a hole in the window. She stopped crying and wiped the tears from her face. Her children needed her. Lifting her youngest from his crib, she gave him a bottle and crawled into bed beside Michael. While Matthew only wanted to be fed and was too young to understand, it was obvious her older son knew something wasn’t right. He wound a lock of her hair between his fingers and nestled his head in the crook of her neck. It took him a long time to fall back asleep. Not knowing what else to do, Sarah changed into her nightgown and stuffed a hand towel in the hole left by the paperweight. She had no idea how she would explain it to Jeff. She was too exhausted to think about anything more tonight. She went to bed, where she willed herself to slip into that peaceful place where reality no longer exists. She was awakened by the sound of Jeff as he stumbled into their bedroom. He reeked of cigarette smoke. Mumbling under his breath, he fumbled to remove his shoes and pants by the side of the bed. Sarah lay still, praying he would fall into bed and pass out. Please, God... please. Don’t... let... him... touch me. She imagined his rough hands pawing at her, his kiss sloppy and tasting of stale beer. He had done it before, coming to her after they had fought, oblivious to her battered physical and emotional state. Slurring his apologies, telling her it would never happen again. Breaking her resolve until she felt obligated to give him what he wanted, feeling utterly empty inside even as Jeff’s body filled her own. Thankfully, Jeff fell into bed beside her and passed out almost as soon as his head hit the pillow. Her mind a jumbled weave of emotions and thoughts, Sarah felt a spark ignite within her. Her heartbeat quickened as the spark grew into an ember, then a fiery flame. A part of her truly hated him now. She listened to his noisy snoring, smelled the cloying stench of liquor coming off his body. The walls pressed in on her, squeezing the air from her lungs until she could no longer draw a breath. The thought occurred to her, not for the first time, that one of these days he wouldn’t stop punching. And then this man will be raising your children. The ice in her stomach turned to steel. And it was at that moment Sarah knew she had to leave, this time for good. Brought back to the present by the sound of Matthew stirring in his crib, she closed the medicine cabinet door and went back to her bedroom, favoring her left heel as she moved quietly about the house. Taking an overnight bag and an old suitcase from the closet, she emptied out her clothing drawers. She packed Matthew’s diaper bag, then crept into the children’s bedroom, where she filled a large laundry bag with clothing and shoes and a few favorite toys and books. She wanted to take more but knew she had to travel light. Money, she thought. I need money. She found Jeff’s work pants in a tangled ball on the floor. She found his cell phone in one pocket and his keys and wallet in another. She opened his billfold. Not much cash. But his credit cards and ATM card would come in handy tonight. She put the items in her purse. Then she went to her bureau and eased the bottom drawer open. Tossing aside their wedding album, she pulled out her Michael and Matthew’s baby scrapbooks and put them in the laundry bag. Dressing quickly in jeans and a sweater, she pulled on her coat and gloves and quietly opened the front door. A blast of frigid winter air stung her face and cut lip. As she walked toward the old station wagon beneath the carport, she glanced over at Jeff’s truck, parked at a sharp angle across the curb. Sarah marveled he had made it home. 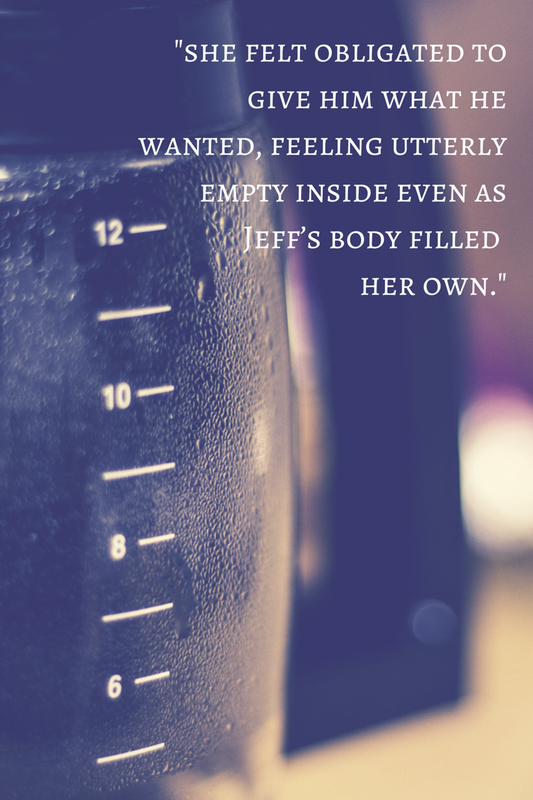 Charged with adrenaline, she looked over her shoulder as she carried items to the car, certain she would suddenly find Jeff’s hulking form standing over her, demanding what she was doing and where did she think she was going. After several trips, she was finished. She then bundled the kids in blankets and took them to the car. Michael woke up as she was carrying him down the front porch steps. “Shhhh... it’s okay, big man,” she said. “We’re going for a ride.” He fell back asleep. She harnessed Matthew into his carrier and buckled Michael into his car seat next to him. She carefully closed the car door. Then she turned to face the small clapboard house she and Jeff had shared. Not a home in any sense of the word; just a wood and concrete structure where four people had once lived together. Looking up at the night sky, she searched for that same slice of moon she had seen earlier through the living room window. She found it high above her, hidden amongst the feathery foliage of a towering evergreen. She watched the plume of her breath materialize in the cold air as quick clouds skirted past. Within seconds, the moon was gone. Sliding into the driver’s seat, Sarah prayed the car would start. Then she prayed the sound of the engine turning over wouldn’t wake Jeff. The carport was right next to their bedroom window. She turned the key. It started. She backed out of the driveway, keeping an eye on the front door of the house, her heartbeat pulsing in her throat. No sign of Jeff. She put the car into gear and pressed the gas pedal. She drove into town and pulled into an all-night convenience store. She started to get out but stopped short when she caught her reflection in the rearview mirror. She fumbled through her purse and put on a pair of sunglasses to conceal the swollen, purple flesh surrounding her eyes. Inside the store, she quickly went down the aisles, filling her buggy to the brim with formula, diapers, bottled water, and snacks. At the checkout counter, the cashier looked at the contents of her cart, then took her credit card without comment and ran it through. “Uhhh... this one’s maxed out,” he told her. The transaction went through, and Sarah loaded her purchases into the car and filled the tank with gas. Then she found an ATM and emptied out their checking account. It wasn’t much, but it would have to do. Heading west out of town, she stopped at the first bridge she came to. She took Jeff’s cell phone and wallet from her purse and went over to the railing, where she hurled the items across the dark expanse of water. “That should slow you down for a while,” she said. Back on the freeway, she decided she would drive a few hours and then find someplace to stop for the night. She wanted to get as many miles as possible between herself and Jeff before he woke up and realized what she had done. She had no idea where she was going. She had purposely gone in the opposite direction of her mother’s house in Pittsburg, because that was the first place Jeff would look for her. He had tracked her down twice before. The first time, her mother told her that surely it wouldn’t happen again, and Sarah gave Jeff another chance. The second time, after he broke her nose and two of her ribs, they were pulling weeds in the vegetable garden when Jeff suddenly appeared on her mother’s back porch, looking contrite and holding an enormous bouquet of flowers. As the miles wore on, the landscape changed from rolling hills and rural countryside to industrial factories and paper mills, their massive smokestacks stretching giant fingers toward the sky. In front of her, an endless ribbon of gray highway rolled out toward the horizon. Afraid she would fall asleep at the wheel if she drove any further, Sarah took the next exit and searched for a motel. She found a Ho-Jo’s and a Holiday Inn, but they were too expensive. Several exits later, she drove into another industrial district, passing one city block after another lined with warehouses and factories, with an occasional diner or drugstore tucked in. She was about to retrace her steps back to the freeway when she spotted a lit sign for what appeared to be a motel. Pulling into the parking lot, she peered through the windshield. The lobby windows were frosted over. She couldn’t see much except for a faint glow of yellow light. She glanced at her watch. Nearly three a.m. She decided to give it a try. Inside the cramped lobby, she came to a thick acrylic partition, scratched and yellowed with age, with a circular hole in the middle for the exchange of keys and currency. She wondered if it was bulletproof. No one was behind the desk. Looking around, she took in the water-stained ceiling tiles and scuffed linoleum floor. In the corner, a lifeless philodendron sat in a stand, its limp leaves turned a sickly yellow-green from lack of water and light. The place was a dive. But she was too tired to care. She brought her face as close to the filthy partition as she dared. Through a narrow doorway, she saw a pair of blue-jeaned legs propped up on a table and a black-and-white portable television. A male voice floated back to her. Finally, the night clerk pushed back his chair and ambled over to the window. If he thought it odd to see a woman standing in front of him wearing dark sunglasses at three a.m. in the morning, he didn’t show it. The answer was thirty-five dollars a night, plus tax. Sarah passed two twenties through the circle. The clerk handed her a single key and her change. The clerk sneered. “For thirty-five bucks a night, lady? I don’t think so.” He shut the cash register drawer and went back to his television. Sarah carted Michael and Matthew to the motel elevator, and the ancient contraption slowly groaned its way to the second floor. When she came to room 212, she inserted the key and opened the door. The smell of cigarette smoke and sour laundry hit her first. Her nose crinkled as she flipped on the light. She was greeted by drab plaster walls and threadbare carpet so stained it was hard to determine the original color. To her left in the tiny bathroom, dark rust streaks stained the sink and toilet. There was a single towel and washcloth on the towel rack. “It’s not the Ritz, but it’ll have to do,” she muttered. She locked the door behind her and carried Michael to the nearest bed, where she turned back the thin chenille bedspread and tucked him in. Then she laid Matthew down on the other bed and surrounded him with pillows so he wouldn’t roll over onto the floor. She rubbed her arms. The room was freezing. She went over to the radiator below the single window and turned it up as high as it would go, but it gave off only a meager amount of lukewarm heat. When she pulled the sheer drapes aside, a graffiti-filled brick wall stared back at her. She turned around and stood in silence as she took in the sparse contents of the room. So this is what my life has been reduced to. Two twin beds and a coffee pot. Physically and emotionally drained, she didn’t bother changing out of her clothes. She climbed into bed next to Michael and pulled the covers up to her chin. She had just fallen asleep when she was jarred awake by the sound of a phone ringing. She sat up in the bed. The sound had stopped. It couldn’t have been Jeff’s cell phone. It was lying on the bottom of the river. And she didn’t have one. She looked over at the phone on the bedside table. Had Jeff found her somehow? But... that was impossible! She turned on the bedside lamp and dialed the operator. After five rings, the same detached voice as the man in the lobby came on the line. “Did you just forward a call to this room?” she asked. “No calls,” he mumbled, and started to hang up. Her hands shaking, Sarah hung up the phone and took a wooden chair from the corner and braced it under the doorknob. She checked the lock again. In the bottom drawer of the nightstand, she found a tattered Yellow Pages directory. She had no idea how current it was. Flipping through the pages, she looked under the S’s for Shelters but didn’t find what she was looking for. Next, she tried the W’s for Women’s Services. Nothing. Then the directory fell open to the C’s, and her eye caught an ad for a local church that sponsored a women’s shelter and soup kitchen. In bold print was a number for a twenty-four hour crisis hotline. She hoped it was still in service. After a few rings, a woman’s voice came on the line. She said her name was Ruth. Sarah fumbled through the conversation and soon found herself pouring out her heart to this complete stranger. The woman didn’t interrupt her. She waited for her crying to slow down before she asked Sarah where she was. The woman then gave Sarah directions to the shelter and she scribbled them down. She thanked the woman and crawled back into bed next to Michael and closed her eyes. Matthew was up before the sun, wanting a bottle. Sarah fed and changed him and took a quick shower while Michael was still asleep. Then she packed the kids in the car and followed the directions the woman on the phone had given her. Three exits up from the motel, she found the address. It was a church. She pulled into the small parking lot. “This can’t be right,” Sarah mumbled. The church was in a rural area, surrounded by a few farms and fields. Behind the white clapboard building was a modest ranch-style house with a towering oak tree in the front yard. A detached garage sat behind it, with a staircase on the right side. Thinking she would run in for just a minute, she locked the doors and told Matthew she would be right back. She hurried over to the door and went inside. The hallway was dark and she didn’t hear anyone bustling about. She showed the woman the address and told her about her call to the hotline. Sarah waited in the office doorway, where she could see her car through the glass exit door. The secretary’s cramped space was a mess, with piles of papers and books and sticky notes tacked everywhere. “I don’t want to be a bother,” said Sarah. Sarah shook his hand. He was a tall man, with salt-and-pepper hair and kind eyes. She noticed he kept looking at her swollen bottom lip and sunglasses. Sarah’s heart sank. “Must have been a mix-up. Sorry to have bothered you.” She turned back toward her car. “What else did this woman say?” he asked. A look passed between the pastor and Margaret. “Thanks anyways,” said Sarah. She went to her car and unlocked the door. “What are you talking about?” Sarah asked. Sarah felt strangely numb as she followed them up the stairs to the large room over the garage. The space was clean and furnished, with a crib and two small beds made up with quilts against the far wall, a separate bathroom, and a kitchen just big enough for a refrigerator and stove. A coffee maker sat on the counter. Two twin beds and a coffee pot. A wave of peace washed over then, like nothing she had ever felt before. She knew this was from God and that right here, right now, He was with her. Not within the walls of a stained-glass cathedral or the hushed halls of some ancient place of worship, but here in this humble efficiency apartment on the outskirts of rural Pennsylvania. The author would like to extend a special thanks goes out to Darlene Perkins for her assistance with this beautiful story!